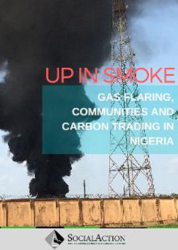 Activists and civil society groups across the Niger Delta have set in motion strategies and mechanisms for tackling corrupt practices in the region. The activists stated that corruption is one of the most potent dangers faced by the region, which is compromising public institutions, infrastructure and social services. 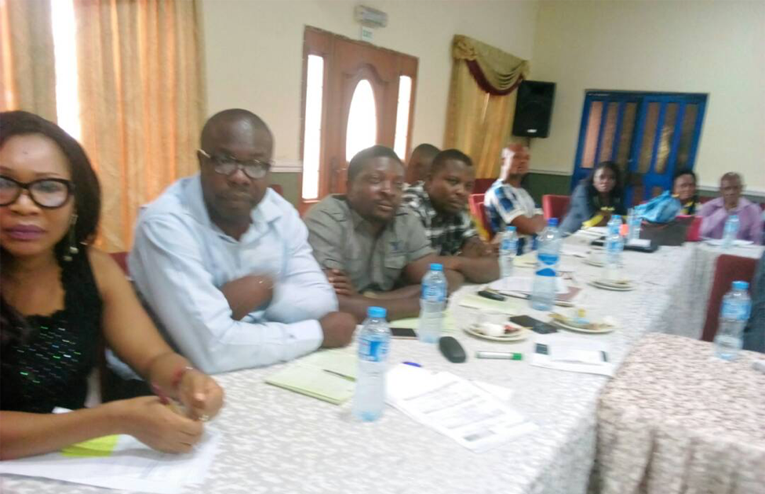 The groups made this known at a two-day workshop on “Amplifying Anti-Corruption” organised by the Social Development Integrated Centre (Social Action), with support from the MacArthur Foundation in Uyo, Akwa Ibom State, on the 23rd and 24th April 2018. The program geared towards giving the necessary traction by citizens and civil societies in the region in the fight against corruption in Nigeria. Through presentations and syndicate sessions, the workshop examined the various legal and policy frameworks concerned with transparency, accountability and fiscal responsibility including the citizens right and access to timely and accurate information regarding public expenditures and transactions. 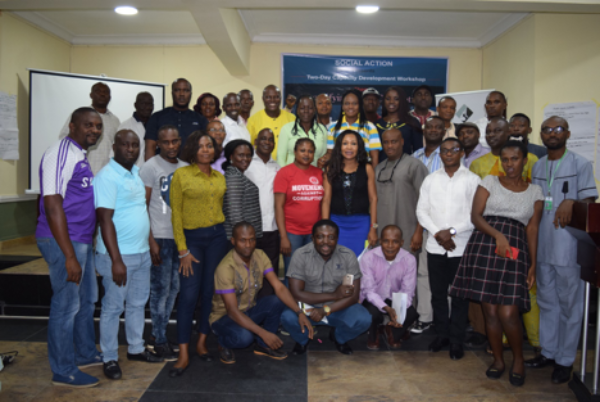 Participants extensively engaged the Public Procurement Act, the Fiscal Responsibility Act, the Freedom of Information Act as well as the Whistleblower Policy of the Federal Government. Other embedded policy frameworks such as the Medium Term Expenditure Framework MTEF, MTSS, Fiscal Sustainability plan, were also brought into purview. Speaking at the program, the Co-ordinator, African Centre for Media and Information Literacy (AFRICMIL), Chido Onumah explained that the Whistleblower Policy, approved in December 2016 and although still at the level of policy, is a useful tool in exposing and ultimately combating corruption. According to him, the policy provides a platform for individuals, groups and organisations to report corruption adding that critical features of the policy were the protection of the whistleblower(s) as well as the incentivization of the exposure of corruption. Onumah stated that these were in line with and towards the objective of the policy which is to expose corruption and financial crimes and to help the government recover stolen public funds while ultimately enhancing transparency and accountability in the management of public funds. Doing an appraisal of the Whistleblower policy, Onumah disclosed that the Initiative which he said was domiciled in the Federal Ministry of Finance, has received 8,373 communications, 123 tips, completed investigation on 534 tips and referred 40 tips to the EFCC and ICPC. He further revealed that through the policy, a total of N7.8 billion, US$378 million and £27,800 had been recovered from corrupt individuals and entities. The AFRICMIL Coordinator pointed out that despite its modest successes so far, there were significant constraints and challenges around the policy, topmost which is the non-promulgation of the policy into law. Without enabling legislation, the Initiative has remained a mere unwritten policy that can be done away with at any time in addition to exposure to manipulations. He said the same fate presently faces the Proceeds of Crime Bill (POCB) which has been stalled at the National Assembly. Making further review of the Whistleblower Policy, Onumah decried the policy’s inadequate provisions for the protection of the Whistleblower as well as its unclear and poorly managed reward system and called for the strengthening of the Policy while also urging civil society activists and citizens to push for the passage of the bill on Proceeds of Crime into law as this will go a long way in curbing corruption in Nigeria. The civil society leader used the occasion to inform participants of AFRICLIL’s Whistleblower support programme, the “Corruption Anonymous”, a CSOs, people-centred intervention “to mobilise citizens as the critical success factor in the war against corruption through Whistleblowing” and urged participants to engage the Intervention actively. 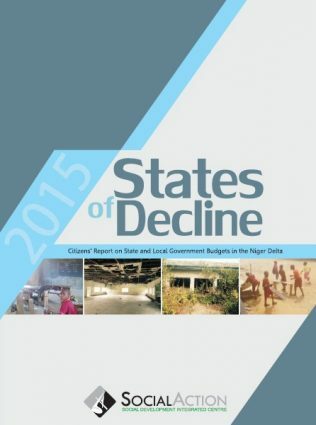 In his presentation, Biobele Arimie, Procurement Expert and Member of the Chartered Institute of Procurement and Supply, Nigeria (CIPSN), who analysed the States in the Niger Delta, posited that procurement was one of the most exploited means of fraud and corruption in the States of the region. He stated that in the Procurement Laws in these States to some extent gives CSOs access to the procurement process including documents and information that are not classified as well as bid process and contract implementation. Arimie pointing out that these were avenues for CSOs to get involved in their States procurement processes in order to be able to meaningfully track and monitor contracts and their implementation for goods, services and works. Are the items to be procured consistent with the needs identified in the needs assessment? Does the procurement plan clearly identify the goods or services to be procured? Have any unnecessary items been included in the procurement plan? Is the timing of the planned procurement reasonable to ensure that the goods or services will be delivered when and as often as they are needed? Arimie pointed out that it was the right of monitoring CSOs to demand for the information and documents on public procurement and as such should not hesitate to activate the Freedom of Information (FoI) Act provisions on any public servant or entity that rebuffs the procurement request, noting that an Appeal Court of Nigeria has by virtue of its ruling in April 2018 made it evidently clear that FoI law applies to all the States of the Federation. The Procurement Expert who bemoaned the level of non-transparency in some States in the region such as Rivers state which he said has kept the State budget away from the public and Akwa Ibom State which he said has not enacted a Public Procurement law. He said these were acts that contravene the spirit and principles of democracy and good governance, insisting that CSOs must work towards ending such anomalies. Other presentations at the workshop focused on Understanding States Fiscal Policy processes and Frameworks; Fiscal Policy Tools to Combating Corruption by the Executive Director of Policy Alert, Tijah Bolton. Public Awareness and Communication Strategies; Critical Components of Public Awareness, Measuring and Evaluating Effectiveness by Peter Mazzi of Social Action. Earlier in a welcome note, the Head of Advocacy of Social Action, Vivian Bellonwu-Okafor stated that corruption has eaten deep into the fabrics of the nation with sadly little or no visible signs of abating as the country has remained high on the index of ratings by local and international organisations on corruption perception. He explained that with the present administration’s three-pronged agenda of Anti-Corruption, Security and Economic Development, the fight against corruption could only be meaningful and productive if citizens at the national and sub-national actively key into it. Osuoka stated that that the Amplifying Anti-Corruption project of Social Action as supported by the MacArthur Foundation was meant to support citizens action to confront and challenge corruption. 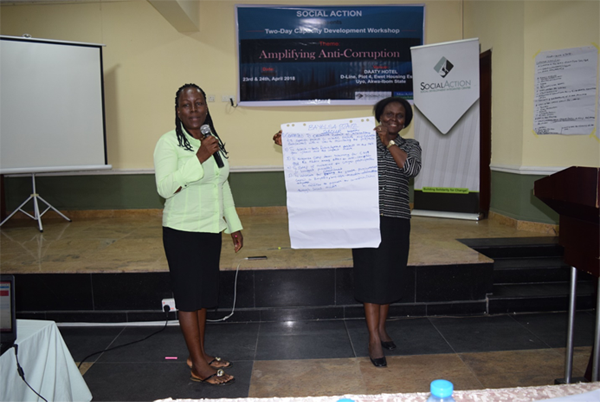 Participating CSOs drawn from the different States in the region including Edo, Rivers, Akwa Ibom, Delta and Bayelsa outlined sets of activities to be carried out in their states to tackle corruption. Some of the strategy steps itemized include: monitoring of abandoned projects in the states; synergizing with the Economic and Financial Crimes Commission (EFCC) and Independent Corrupt Practices Commission (ICPC); public enlightenment campaigns on corruption; strengthening strategic partnerships; formation of anti-corruption clubs in primary and secondary schools in the region; advocacy visits to state actors and step-down trainings for various stakeholder in the states and local councils amongst others. As part of ongoing anti-corruption work at the sub-national levels of government, Social Action organised State Level Sensitization Workshops in the Niger Delta region of Nigeria during the first quarter of 2018. The workshops aimed to enhance the capacity of CSOs to understand the budget and to use it as a tool to engage the government on accountability and good governance. 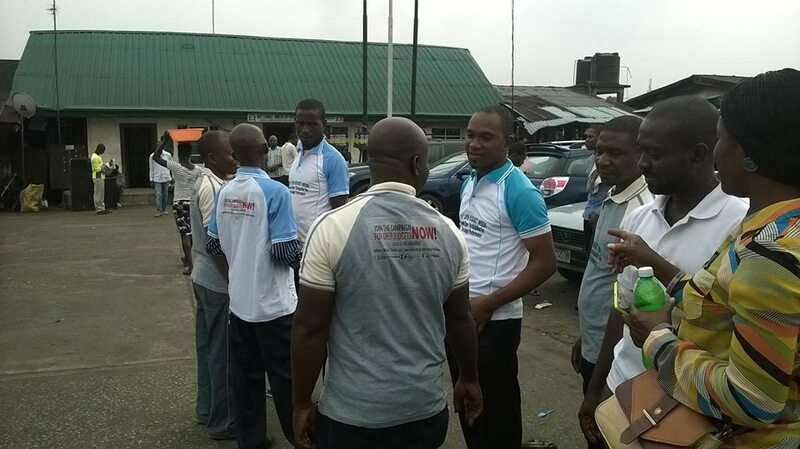 Representatives of citizens groups participated in the workshops in Akwa Ibom, Bayelsa, Delta, Edo, Ondo and Rivers States. 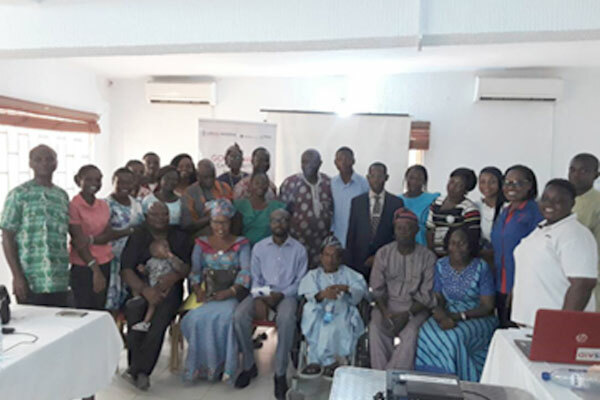 Over thirty participants in each of the States received training on budget processes and participation, and strategies for achieving budget democracy and accountability.